Velo Composite Baseball Bat (-11) - White/Purple/Orange - FP8V11-33/22. Series: Velo The Velo is your top of the lineup hitter, your table setter; equipped with a ton of speed. And great bat control. With a stiffer handle, and the lightest swing weight thanks to our Comp-Lite Endcap, this bat is a constant favorite for those looking to catch up to faster pitch speeds. 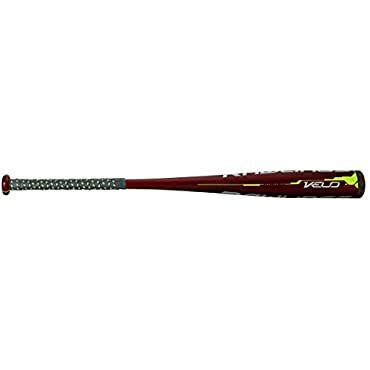 Size Code: 33 Size Description: 33"" Barrel Size: 2 1/4 in Bat Drop: -11 Bat End: N/A Bat Finish: N/A Bat Frame: N/A Bat Grip: Purple/Orange Bat Handle: N/A Bat Length: 33 Bat Level: N/A Bat Material: Composite Bat Type: Fastpitch Softball Bat Warranty: 1 Year Bat Weight: 22 Bat Wood Type: N/A Item Type: NEW 2018 Product Highlights: Traditional two-piece performance - combines stiff handle with flexible barrel, maximizing swing speed and distance Ultra-light carbon fiber improves swing speed Comp-Lite() Endcap - creates balance, generating faster swing speed Approved by- ASA, USSSA, NSA, ISF, ISA and all other assosciations using 98 MPH w/ ABI Length/Weight: 28""/17oz.,29""/18oz., 30""/19oz., 31""/20oz., 32""/21oz., 33""/22oz. While we aim to supply accurate product information, it is sourced by manufacturers, suppliers and marketplace sellers, and has not been provided by Overstock. Rawlings Velo BBCOR: BB7V Baseball Bat - 32" 29 oz. Rawlings 2018 Velo 32 / 29 2.625" Barrel College High School Alloy Baseball Bat -- Free 1-3 Day Delivery With Hassle-free, 30-day Returns! Here are all the current Coupon Codes we found for Rawlings Velo BBCOR: BB7V Baseball Bat - 32" 29 oz.